The CHEO Foundation raises funds in support of the Children’s Hospital of Eastern Ontario (CHEO), The Ottawa Children’s Treatment Centre (OCTC), Roger Neilson House and the CHEO Research Institute. With 167 beds, 71 outpatient specialty clinics and one of the busiest emergency departments in the country, the doctors, nurses, researchers and staff at CHEO-OCTC touch the lives of over 500,000 children and youth each year, providing the best possible health care for the children and youth in eastern Ontario, western Quebec and beyond. The Foundation is responsible for developing, accepting, distributing, and recognizing philanthropy. Ongoing community support helps the hospital purchase specialized pediatric equipment and funds a wide variety of pediatric programs, research, medical and nursing education, and assistance for families in crisis. In the next 20 years there will be 70,000 more children and youth in our region than there are today and the need for our services will continue to grow. Corporate support is an important part of the community’s efforts to help CHEO-OCTC remain strong. Our hospital functions with the help of government funding, but it is simply not enough. 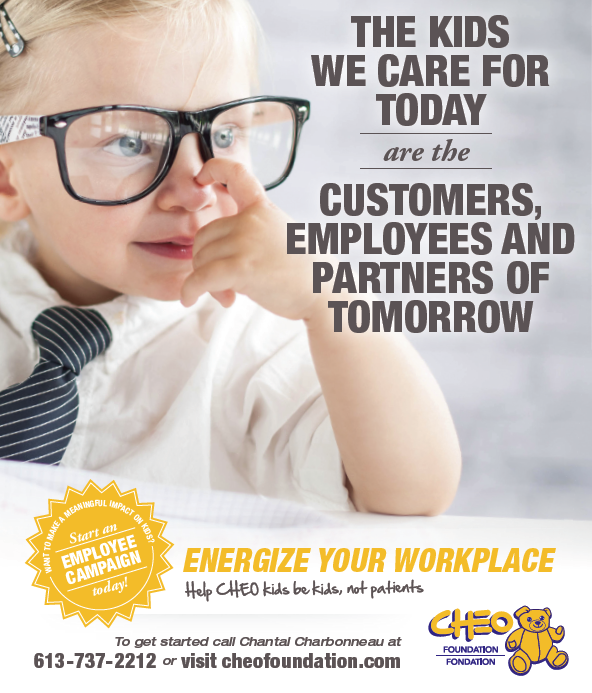 The excellence in health care that CHEO-OCTC provides would not be possible without the dedication of individuals and businesses in the National Capital Region and beyond. Medical Equipment: As the only pediatric hospital serving eastern Ontario and western Quebec, it is paramount for the doctors, nurses and staff at CHEO-OCTC to have the most up-to-date tools and equipment. Clinical Services and Programs: The CHEO Foundation funds numerous clinics within CHEO-OCTC from asthma to infectious diseases, weight management and everything in between. With over 170,000 patient visits to CHEO-OCTC’s 71 specialty clinics each year, donations in support of the clinics and programs at CHEO-OCTC are always an urgent need. Research: Improving the health of our children and youth is at the very core of the work being done at the CHEO Research Institute. Research at CHEO-OCTC covers a full spectrum of pediatric topics. Thanks to donor dollars, funding keep scientists and clinicians working to discover new ways to more gently treat CHEO-OCTC’s most vulnerable patients. One of the ways in which we make the best use of donations received is by harnessing the power of volunteers. Their various expertise and life experiences help ensure the success of our fundraising events. Opportunities include CN Cycle for CHEO in May, the CHEO Telethon in early June, and the RBC Race for the Kids in September just to name a few. CHEO-OCTC has been providing family centred care to families in eastern Ontario, western Quebec and beyond since 1974. Mollypenny, CHEO-OCTC’s beloved therapeutic clown, is part of the Child Life department. Dr. Nishith Goel, CEO Cistel Technology Inc.
James McKellar, President, AM-Tech Electrical Inc.
David Rattray, President, Public Accountability Consulting Inc.